Develop and manage complete websites in just minutes with no programming knowledge required. Easy and fast installation. Build a complete website directory in just minutes. No need for technical skills, it can't get any easier!. 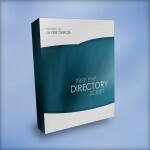 Advanced version of the directory script with more features to help you manage and monetize your website. Replicate the whole Open Directory Project directory or any part of it the fastest and easiest way.